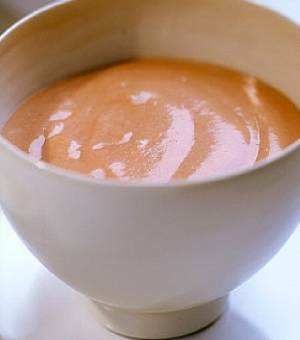 This simple Cuban sauce goes well with just about everything, and I put it in sandwiches, on meats, vegetables, and it appears often in my dreams. N.B. if you cannot find sour orange juice, combine equal parts lemon, lime, and regular orange juice. 1. Add the olive oil to a pan and set to a medium heat. Add garlic and cook until soft, but not brown (30 seconds or so). 2. Add the juice, salt, pepper, and cumin if you desire it and raise the heat to high, allowing the mixture to boil for a few minutes. Cool before serving. It is best served immediately, but should keep for a few days if refrigerated. Some recipes call for cilantro to be added, which is good if you are someone who likes cilantro (not everyone does) but cilantro is not a classic Cuban addition to a mojo sauce. When cilantro is used the sauce is referred to as “Mojo Verde” and appears less often in my dreams. Inspired by my love of Cuban foods, I make this steak often, and its robust flavor is like a predator with your tongue as its prey. I don’t mean to imply that it is overpowering, but the strong lime flavor blends with the beefiness of the skirt steak, and the combination announces itself clearly upon arrival. Skirt steak is a particularly fatty and flavorful cut, so it holds up well to the lime, and remains juicy even after an assault on the grill and then the pan (if you choose to finish the steak the way I do). This is perhaps the best way to serve this cut of meat and anyone who tells you otherwise is probably a vegetarian. N.B. Limes can be difficult to juice so one thing I have been known to do is buy bottled lime juice and use 6 tablespoons of that instead. With the garlic and meatiness of the steak, no one will notice the difference. 1. 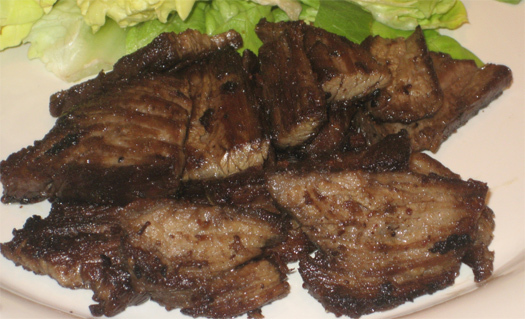 Cut the skirt steak into pieces small enough to easily fit in a bowl or plastic bag. 2. Combine all ingredients in a covered bowl or plastic bag and allow the steak to marinate for at least 2 hours (I marinate as long as 8 hours with no problems), moving the pieces around occasionally to ensure that the lime juice gets to all the sides of the steak. 3. Remove the pieces of steak, however there is no need to scrape any of the garlic pieces that stick to them, they are very flavorful when cooked. The meat is then preferably cooked on a grill for maximum flavor, however I just as easily broil the meat in the oven. For those who are not interested in adding to the work load, the cooked meat can be served. However I like to take one additional step. 4. (Optional) Cut the steak into strips and quickly fry them in a pan with a little bit of oil to make them nice and crispy on the edges and then serve. Serves 2 and goes really well with yuca, garlic mashed potatoes, or plantains (sweet or savory). This dish goes so well with a Cuban Mojo sauce that it’s just mean not to try it. It’s so good, I sometimes pretend we’re related. 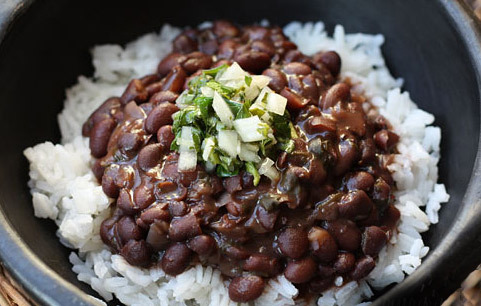 This is a variation of the classic black beans and rice dish which is a favorite of my family. While I have never been a big fan of beans, for some reason I can’t keep myself away from this particular dish, so I make sure to cook plenty as it only gets better as the leftovers sit. For those who want to limit the fat content, the rice can easily be made without the coconut milk and this dish is just as good. 1. Cut the onion and garlic into small pieces and saute at a low heat until the onion is translucent. The garlic can be pressed if desired instead of cut. This will impart a more spicy garlic flavor. 2. When the onion is translucent, add the beans including the liquid in the can (a lot of protein has leached out into the liquid and this will add to the creamy mouth feel of the dish if it is included). 3. Add the bouillon cube and simmer the beans at low to medium heat for at least 20 minutes, preferably longer as they will get softer the more they cook. There is no need to cook them more than an hour, though. As they cook, periodically stir the beans, and crush a few of them against the side of the pot if you wish to impart more creaminess to the dish. When the beans are done to your satisfaction, remove from the heat and serve over rice. 1. The key here is to replace some of the water with the coconut milk, so check the instructions for your rice and if you require 2 cups of water for 1 cup of uncooked rice, add the coconut milk to a measuring cup and top off with water to reach the desired volume of liquid. If you would prefer to not use coconut milk for any reason, just use the required amount of water instead. 2. If you have a rice cooker, put rice and liquid in and turn on. If you are using a pot, bring the liquid to a boil and then stir in the rice. 3. Cover the pot and reduce the heat to a simmer (very low boil), and let cook for approximately 20 minutes, or until all the liquid is absorbed. 4. When the rice is done, fluff it with a fork and let sit covered, in the pot for 5 minutes. If you can’t wait to eat because the beans look so good, feel free to put the rice on a plate or a bowl anyway and cover with beans and eat. In most cases this will serve four people. However, in my house, two of us manage to eat this all in one sitting. You can easily double or triple the recipe with no modifications.